There is an art to being a great Chalet Cook. We will show you how to master it, enabling you to get the most out of both your job and life in the mountains. With many seasons of experience in the chalet industry and working alongside ski companies we have designed a course to train the perfect chalet host. Designed specifically for ski season Chalet Cooks, the course will boost your confidence, develop your culinary skills and knowledge of cooking and give you the ability and inspiration to create your own masterpieces in the kitchen. We will show you short cuts and pass on valuable tips of the trade, teach you how to handle disasters and equip you to cope with the unexpected problems you may come across while cooking at altitude (exploding cakes being the most memorable one!). Three week, five course menu plans, including vegetarian options and children’s meals with detailed recipes and time plans for cooking at altitude. The Orchards Cookery Book supplied contains hundreds of additional quick, easy and impressive recipes, so that students can work at the top end of the industry if they wish, but still have time to enjoy life in the mountains. A detailed “Chalet Guide” which contains all the information you will need to know about running a chalet eg: a typical chalet host routine; the job packages companies offer; living in the Alps; what to take out with you; what to expect at the start and end of the ski season; menu planning; how to cater for special diets and food allergies (coeliac, diabetes etc); food translations for shopping in a foreign languages (French and German); cleaning and changeover day duties and checklists; making welcome speeches; Health and Safety in the kitchen and the legislation etc. An Orchards Chalet Cook's goodie bag to take with you, containing all sorts of essential pieces of equipment. Help and advice with CV writing, interview training, ski company presentations and interviews at the school (see recruitment page). The opportunity to take the Level 2 Award in Food Safety in Catering (an optional extra on a two week course, details below). Henry’s Avalanche Talk. Henry is well known and experienced Mountain Safety expert in Val d’Isere and he has prepared a bespoke training video for Orchards students to introduce them to the real risks of skiing off piste and the dangers of avalanches. A wine tasting course with a cheese board (an optional extra available on most courses). Our courses are intensive but great fun, with dinner parties in the evenings enabling students to get the most out of their time at The Orchards. In addition to the cookery course, during break times students have the opportunity to: receive personal help and advice with CV writing; have interview training; attend ski company presentations and interviews; take the Level 2 Award in Food Safety in Catering; have a tour of the kitchen garden to see how some of the fruits, vegetables and herbs used in the cookery school are grown and harvested; learn quick ways to deal with a brace of pheasants (during the shooting season only). Students can also burn off a few calories in the gym or by playing volley ball, football, croquet, badminton etc. in the garden. 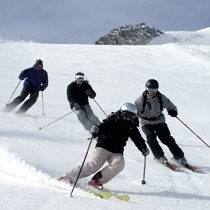 We recommend the two week course to Gap Year students wishing to do a ski season (if time and money permits). We will give you the opportunity to start the season with the perfect routine. If you don’t have time to ski to your heart's content and make the most of the aprés ski, what is the point of putting up with the cold! The course is a good all round cookery course so is also suitable for students who wish to learn to cook and set themselves up with a new life skill. It also qualifies for the Residential Project of The Gold Duke of Edinburgh's Award. "Keep up the good work – yours is still the best course for chalet staff bar none." "Mike is returning with us next season and he was officially our most successful member of chalet staff last winter." "The Orchards send us consistently well-trained staff. It is amazing how much students learn in just 2 weeks. Lucy and Isabel manage to convey their love of good food and cookery to every student and it shows when these students come to us for interviews. However, it's not just the cooking they learn, The Orchards' students also learn how to clear up, keep a kitchen clean and be charming hosts and hostesses!!" "It is not just the innocent arts of baking and steaming that are being passed on here, but the more worldly secrets of professional chalet hosting." "The Orchards School of Cookery takes rookie cooks and transforms them into competent chefs capable of producing a sophisticated four-course meal for a chalet-load of hungry skiers without even breaking a sweat…” “… an investment that quickly yields a return." "…they provide you with all of the culinary skills and insider knowledge you need to be a top notch, efficient chalet host." "It is these little gems of information - as well as learning how to plan and cook a menu of dishes to impress even the most finicky food critic - that students, who have travelled from as far as Australia, are willing to pay to get their hands on." Edge Magazine... "Learn To Do More Than Just Cook"
"The Chalet Cooks course involves an intensive tuition in gourmet cuisine along with tips on time management and the all-important organisational skills required to run a chalet." "The Orchards really covers all bases and its success rate is a marvel." "Through a doorway in the wall of the garden, lies a stunning kitchen garden where students have the opportunity to see how the fresh produce used at the school is grown. Orchards Cookery School provides fantastic opportunities for anyone wishing to become a better cook but particularly for young people who want to gain experience and learn the necessary skills for their gap year and university ventures." Students have the opportunity to obtain a ‘Level 2 Award in Food Safety in Catering’ during a two week Chalet Cooks Course). 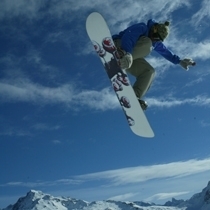 Many ski companies look for chalet cooks with some formal training / qualifications in Food Safety / Hygiene (as do catering companies and agencies looking for cooks). Following feedback from ski companies we have adapted our two week Chalet Cooks Course so that we can provide students doing a two week Chalets Cooks Course with an opportunity to gain a ‘Level 2 Award in Food Safety in Catering during their course. (Previously we offered Level 1 but as students with Level 1 are often made to do Level 2 by ski companies before they start cooking for chalet guests we have upgraded to the next level). The course is delivered during the chalet cooks course by our Tutors and is overseen by an independent Chartered Environmental Health Practitioner who runs an accredited training centre meeting strict teaching standards required by the Chartered Institute of Environmental Health. On the Wednesday afternoon of the second week of the course (during a break from cooking) students will have a training / revision session with the independent Environmental Health Officer, and will then sit a short multiple choice paper. Upon successful completion students are issued with a Chartered Institute of Environmental Health Award. Food hygiene is a very important part of being a chalet cook and whilst some companies train people in Food Hygiene at the start of the season, others are now looking to recruit staff who are already trained and have the qualification (saving them the cost of training people in the Alps). The certificate can therefore be a very useful thing to have on your CV and could potentially help in being a deciding factor as to whether a company offers you (or somebody else....) a job! CIEH qualifications are recognised around the world by Environmental Health Professionals and the qualification can be useful for a wide range of catering jobs. "We have paid for his education since he was 7 years old, but I think two weeks with you was the best money we ever spent on him. Many thanks to you and your team." "After receiving over 15 offers for interview (many thanks for that) we have decided to go with Le Ski, who interviewed us during our course with you. Thank you again for all your help and support both during the course and following. You guys are a treat to the industry!" "Awesome two weeks, couldn’t have enjoyed it more." "The Orchards really helped me to visualise my passion for cooking and I would just like to thank you again for a superb week filled with many entertaining memories." "I just wanted to say thank you so much for an incredible time at The Orchards....that was honestly the best experience of my life." "I wanted to write to you both to say what a marvellous time Polly had on the Chalet Cooks’ course. Not only did she learn a huge amount, but the course instilled a really good work ethic: that working hard is rewarding and fun. For her, it has resulted in the best outcome, in receiving a job with Powder White – and I’m sure that the training she has had at Orchards with be invaluable every day of the season. Our heartfelt thanks for providing such a superb course – I have no hesitation about recommending it, as the perfect gap year course." "My daughter Sarah-Grace was with you in November for the chalet cookery course and I just wanted to let you know what a fantastic success it has been for her. I have to admit that I was very dubious when she told me she had chosen the course herself from the internet with no other background information....and that it was only for five days! However she had worked hard to pay for it herself and she was not for turning. Needless to say, with fantastic snow again this year she is having a wonderful time. I am certain however, that all she learned at The Orchards - both cooking and management has been the most major contributor to her chalet confidence and thus overall enjoyment. I am also certain that you are very unlikely to have received personal feedback from the busy slopes - hence this missive from a very appreciative mother! With best wishes for continued success." "I have just returned from cooking for the golfer ...(well known golfer!) at the Open this year. I cooked for him last summer as well and am being flown out at Easter (if my holidays coincide) to cook and hostess for him at the Masters in Augusta! Apparently he was impressed by my ability to hostess and cook at the same time. So thank you very much for everything you taught me all those years ago and for getting me the job with YSE to follow. The organisation and high standards definitely impressed ...(well known golfer) and his team. I never thought I would end up cooking for a celebrity and earning £1500 in a week!" "I have been meaning to write every since Nancy came home from her 5 day Chalet Cook course with you to say a huge thank you for everything you gave her during her time with you. When I collected her off the train on the Friday evening I wasn't quite sure what to expect! As it was - even though she'd had a pretty long and tedious journey with a couple of changes, and it was late in the evening - she didn't draw breath (that might not surprise you!) about what a fantastic week she'd had, and how much she had achieved and hugely enjoyed achieving during that time! And the fun she'd had with the other people on the course. The car smelt of garlic for the next couple of days (which was lovely! ), and we have been absolutely bowled over by her confidence and enthusiasm in the kitchen since her return. Nancy's two brothers were home from university over Easter, and she made us several delicious three course meals, and when she decides to have a bit of a bake, she knocks up three cakes, where one would have previously presented quite a challenge! I can't tell you how impressed, and really thankful I am - apart from the fact that we may have to go up a size in clothes!" "The courses you run at The Orchards are of an extremely high standard and the caliber of students that leave you after only a fortnight are exceptional"
This is a belated thank you for all your assistance in helping my son secure a chalet host position for the 2011/2012 ski season. He has just returned from Courcheval yesterday where he has had the best time. Having arrived at the start of your 2 week cookery course with the most basic cooking skills last November, he loved every minute of the course and it gave him the confidence to cope with looking after 8 guests at a time on his own. He was offered the role at one of your interview days so the whole experience was initiated through Orchards Cookery. As he left for France on the very last day of his cookery course, I have still not sampled his new found cooking skills and am looking forward to this shortly. I cannot thank you enough for a simply am amazing week! I had a wonderful time, met some great people and had some incredible food. I can really see why all my friends spoke so highly of The Orchards.